Tree Trimming Cost & Prices | How Much Does Tree Pruning Cost? To keep your yard looking as attractive as possible, you periodically need to have its trees trimmed into shape. In addition to making a tree look more aesthetically pleasing, trimming or pruning can be used to remove dead or broken limbs that can pose serious hazards. Until you actually need a tree to be trimmed, you may be completely unaware about how much it costs. The cost of tree trimming varies depending on a number of factors including whether you do it yourself or hire a professional company. Learn more about tree trimming prices below. Although DIY tree trimming costs may be low, it also requires a lot of time and effort. Furthermore, it can be extremely dangerous. The reason that professional companies can command relatively high prices is because trimming a tree is no easy feat. Unless you just have a small tree to trim or prune, you should probably let the professionals handle it for you. If you do decide to take matters into your own hands, make sure that you have the appropriate equipment. In some areas, it may be possible to rent heavy-duty gas tree trimmers. To purchase a standard hand-held lopper or pruner, you can expect to pay around $40 to $50. A gas pole pruner will set you back at least $180, but it will get the job done more quickly and efficiently. 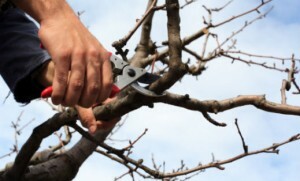 Keep in mind that hand-held pruners and loppers are only effective on small branches and fruit trees. If you have large trees that need trimming, your only viable option is to hire a professional tree-trimming company to do it for you. The majority of homeowners hire professionals to handle their tree-trimming needs. If you ask a company, “How much does tree trimming cost?” you will not get a straight answer right away. The main reason is because the total amount depends on a variety of things. However, you should be able to get a quote. In fact, you can contact several companies and collect quotes from all of them. Make sure to ask plenty of questions when hiring a tree trimming service. After that, compare your quotes to see who has the best prices. This is the easiest and best way to get the lowest price. 30 Feet and Shorter – Trees that are up to 30 feet high, like Russian olive trees and dogwood trees, cost between $75 and $450. 30 Feet to 60 Feet – It costs between $150 and $875 to have trees in this height range, like crab apple trees, trimmed by the pros. 60 Feet and Taller – You can expect to pay between $200 and $1,000 or more to have an exceptionally tall tree, like a red oak or a pine tree, trimmed by a professional company. Certain services may add to your total tree trimming cost. For example, you will pay around $250 per hour for emergency tree pruning and trimming services. To have broken or dead limbs cleared from a large tree, you will pay approximately $1,000. If the company doesn’t have a truck, the workers will have to climb the tree, which will push the bill over $1,500. Although tree trimming costs can be rather steep, it is well worth it to let the professionals handle it for you. Remember to contact the utility company if a tree branch or limb is dangerously close to a utility line. It’s much better to be safe than sorry. I would like an estimate from a company near grand haven in flagler county. I have 3 oak trees that need trimming.